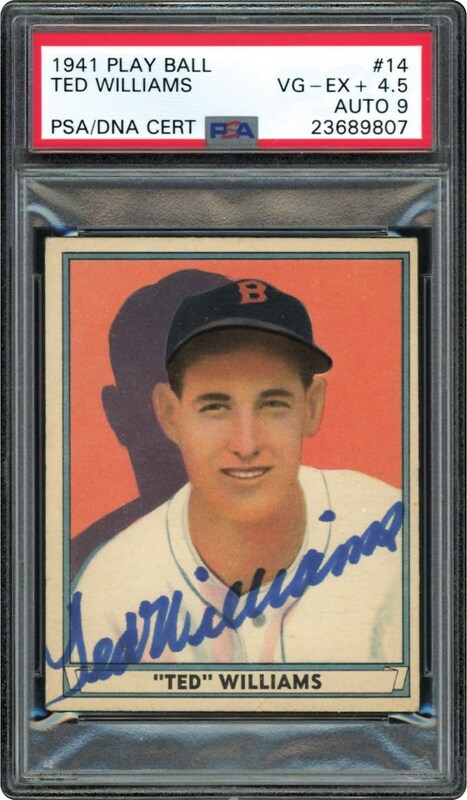 Lot # 121: Ted Williams Signed 1941 Play Ball #14 (PSA AUTO 9 MINT) – One of Only 7 PSA Encapsulated Examples and the HIGHEST GRADED AUTOGRAPHED SPECIMEN! The 1941 season would see Ted Williams bat an unfathomable .406, the last player to ever achieve a .400 batting average in a single season. Only two years into his remarkable Major League career, the Splendid Splinter" was embarking on a career that would place him as our National Pastime's greatest hitter ever, achieving Ted's lifelong dream. 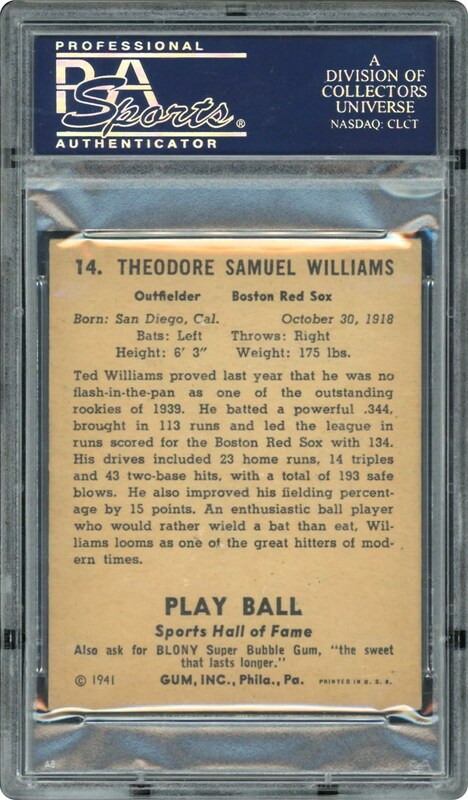 Aside from his hallowed 1939 rookie card, most would agree that Ted's most popular card is his 1941 Play Ball subject issue, issued during the year he would achieve the near-impossible batting feat. While PSA has currently graded over 1,000 of these 1941 Play Ball William's specimens, only a microscopic-like 7 examples (0.7%) have managed to depict a Ted Williams autograph. Presented here just happens to be one of those seldom surfacing signed 1941 Play Ball Ted William's, an outstanding PSA 9 Auto example that synonymous with "Teddy Ballgame's" unparalleled hitting prowess, currently stands as the finest of the 7 PSA encapsulated specimen! The bold blue sharpie signature presents itself in solid "Mint 9" strength, scripted across the hallowed Williams seemingly timeless portrait image. The renowned image emanates brilliant eye appeal and no glaring flaws are evident, with the "best of the rest" grade solidifying this scripted offering as one of "The Kid's" most treasured artifacts from that immortal 1941 campaign!